N3200, the subject of Guy Martin’s film last week. Historic aviation isn’t often the subject of prime time television shows, but every now and again a program comes along that makes you wonder why not. Guy Martins recent offering; “Guy Martin’s Spitfire”, tracing the construction of Spitfire MK1a N3200 was just that. The show struck the right balance from the off. There were excellent detailed sequences of the aircraft being put together, combined with some wonderfully shot air to air sequences, as well as informative story-telling of the Spitfire’s part in the war and the people who flew them. Usually these shows tend to fall more towards the general viewer rather than the enthusiast, which is understandable given the bulk of viewers will be the former. But with this program, there seemed to be enough to keep both sides happy. The in depth engineering section of the film was kept light and entertaining, with Guy’s enthusiasm coming through. They also provided insight from the people who actually perform the day-to-day work on the restoration. There was of course, the obligatory, presenter gets to go up in the two-seat spitfire moment. (I’m not jealous, honest.) It was nice to see some real excitement in Guy’s face during this segment and to hear a short interview with Cliff Spink about flying the aircraft. Having the mock dogfight with the ME109 was an inspired way of showing how the battle of Britain was fought, rather than wheeling out the Battle Of Britain film reel again. Though it must be said, the archive footage that was chosen was well thought out, with attention paid to choosing the correct mark and colour schemes for each theatre. The modern day aspects of the film were balanced out nicely with interview snippets from veteran Spitfire pilots and from some of the women who built the aircraft during the war. A particularly nice moment was when guy asked the young man near castle Bromwich about the “modern art” spitfire sculpture. To Guy’s surprise the young lad rattled off a brief history of the areas connections to aircraft, which was a touching moment. 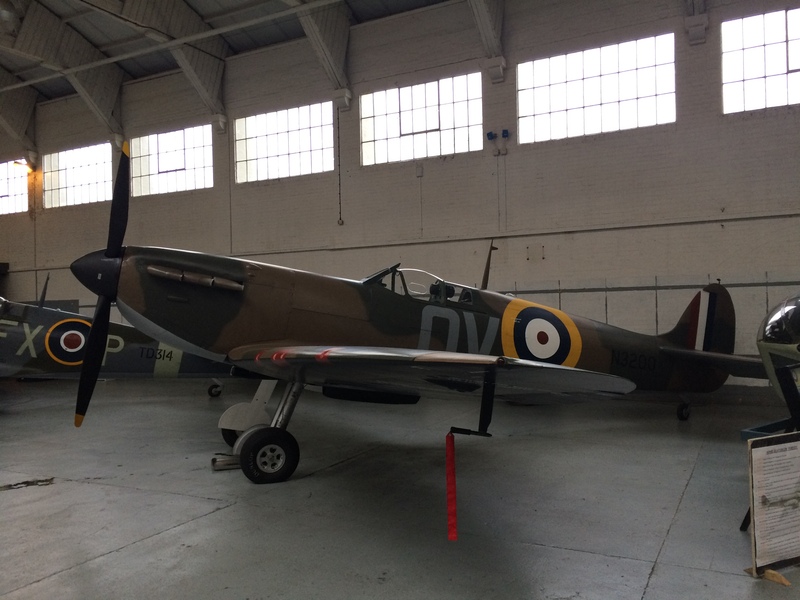 The central theme of course, besides the Spitfire itself, was the story of Sqd Ldr Stephenson, who was flying N3200 on the day it ended up on the beach in France. His personal story was well spaced throughout the film, coming to a conclusion as his daughters see their fathers spitfire for the first time, another emotional moment. The final moments of the film centered around Guy seeing the aircraft fly for the first time, which, once again had some wonderful air to air footage as well as on board cameras. Hearing John Romain give his seal of approval after landing the Spitfire having performed a fly-past for Guy and Stephenson’s daughters was a fitting note for the program to end on. What is more remarkable than this program being made is that it managed to secure a 90-minute slot on a Sunday evening. I suspect it was this extra half hour that allowed the filmmakers to strike such a good balance between in-depth footage and general history of the type. Of course there are a number of stages of the restoration that were not included in this film, but without it being a two-part program or much longer there really wasn’t much room. Hopefully an extended cut will be released at a later date. Overall this film sits up there as one of the better historic aviation television programs, with excellent balance and good pacing. Hopefully this is the first in a line of such films from Martin and channel 4. If you missed the show, it can be found on 4OD. I was recently contacted by Skydock, they took part in the filming of the documentary, Guy used their firing range when trying out the machine guns. Don’t forget to like Warbird Tails on Facebook and Follow us on Twitter. Hi, love this article – great review of the show. It was certainly a great moment when the Spitfire took to the skies again! Actually, would you be able to send me an email, as there’s something I’d like to ask about your review? Thanks! Hi Ian, thanks very much. Of course you can, I can’t find your email address though.